The assumption of equal intervals says that all distances between adjacent answer categories are equal in the repondents’ perception. This assumption is an attempt to justify treating ordinal variables as if they were metric variables. Doing so enables one to compute means, standard deviations and Pearson correlations on ordinal variables. This is simpler than using more appropriate techniques. If it is assumed that intervals between answers are equal, an ordinal variable is treated as a metric variable. Now we may simply calculate that men scored (2 + 4) / 3 = 3 on average and women as well (3 + 3) / 2 = 3. This answers the 'unanswerable' question from our marketeer. Everybody happy. Or not? What if the Assumtion Doesn't Hold? If this holds, men are actually more satisfied (1.5 + 3.5) / 2 = 2.5 than women (2.25 + 2.25) / 2 = 2.25. So the conclusion drawn earlier was misleading. According to some academic standards, making the assumption of equal intervals is unsound practice and strictly forbidden. However, in real life research (depending on your field) it may be perfectly common. At least be aware of this controversy and keep in mind what you're doing. Next tutorial: Sampling Distribution – What is It? I think they really don't. I think treating rating data as interval -which I do almost routinely- is really just preferring a pragmatic approach over a theoretically more sound one. 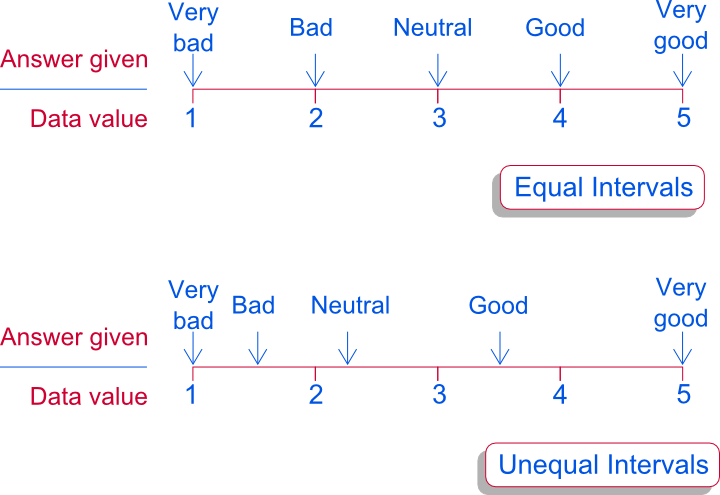 I find it very difficult to convince people that rating scales do not necessarily produce interval-type data.